. :: HORSES & HOPES; A GRAND EVENT INDEED! ::. >> HORSES & HOPES; A GRAND EVENT INDEED! HORSES & HOPES; A GRAND EVENT INDEED! HORSES & HOPES CSI 1*(A)-Cairo International Show Jumping Festival proved to be a successful and grand event indeed! Organised and hosted by SMI (Sports Marketing International) - in partnership with ROOTS MARKETING & ADVERTISING, the Festival was approved by the FEI and the Egyptian Equestrian Federation. The Ferosia Club, established in 1938, is a cradle for equestrian sport in Egypt and was inaugurated by Mohamed Taher Pacha, the 1st President of the Ferosia Club & member of the Egyptian Olympic Committee (1936-1945) and King Farouk. Invited by HORSE TIMES Magazine, HORSES & HOPES hosted international foreign riders France’s Alexandra Ledermann and Tony Hanquinquant, Kuwait’s Ali Al Khorafi, Saudi’s Fahad Al Eid, Lebanon’s Karim Fares, Spain’s Manuel Fernandez Saro, Portugal’s Miguel Bravo, Holland’s Tom Martens (who rides for STEPHEX Stables), Nuri Dijks, Davy Meijers and Sjaak van der Lei, and Italy’s Eugenio Grimaldi and Veronica Resca - all riding on borrowed horses. In parallel to the show jumping competitions that included the Small Tour, Big Tour, Small Grand Prix, Big Grand Prix, the 6 Bar and a JUMP & DRIVE competitions, the two day festival was a venue for a newly formed concept by SMI for integrating sports with social entertainment. The diversity of events that included the sponsor’s exhibition area, the children’s workshop quarter, the shopping bazar, the Special Olympics riding team display, and the fashion show run by famed Egyptian designer Hany Elbehairy, brought about 2,000 spectators per day. The show jumping courses were designed by international course designer, Egypt’s Ahmed Talaat on the Ferosia Club’s sand and fiber 70 meter x 70 meter arena. The Small Tour (Two-phase 125cm) was won by Egypt’s Mohamed Elboraei on Tina, while also from Egypt, Abduallah Yousef on Carlina came in 2nd, Amr Gamal on Olivia came in 3rd, and Mohamed Medhat on Tabarak Allah came in 4th. 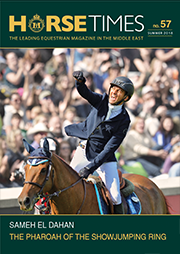 The Big Tour (Two-phase 140cm) was also won by an Egyptian; Dr. Karim El Sobky on Aragon, with two other Egyptians coming in 2nd and 3rd, Dr. Sameh El Dahan on Elegance Casablanca and Mohamed Sabry on Unique, while Spain’s Manuel Fernandez Saro on Varajanea came in 4th. The Small Grand Prix (One round with jump off, 125-130cm) saw the placement of Egypt’s Karim Hamdy on Beltone Partner 1st, Portugal’s Miguel Bravo on Infinity 2nd, Yahia Wageh on Parabel’s Flash Bounce 3rd, and Holland’s Nuri Dijks on Solid Choice 4th. The Big Grand Prix (Two rounds 140cm) saw placements of four Egyptians in top spots: Yehia Wageh on Easy Jet 1st, Dr. Karim El Sobky on Aragon 2nd, Mohamed Sabry on Unique 3rd, and Amr Gamal on Ribel Z 4th. (For for results, go to http://horsetimesegypt.com/news_details.asp?id=46) The highly spirited JUMP & DRIVE competitions witnessed an altered theme to what is commonly known! Riders jumped but businessmen drove, all in the hope of raising awareness and donations to Egypt’s Cancer Hospital – while the 6 bar competitions generated standing ovations and animation from the spectators. Platinum sponsors of HORSES & HOPES included: Emmar Misr, BMW, Platinum Club, Sigma Capital, Fast Tours, and Shoura Mubadala. Gold sponsors included: Khodeir Egypt, Mcdonalds, Timetrade Longines, Hyaat, Yellow Pages, Lifebuoy and Nile Takaful, while Silver sponsors included: Swiss Airlines, Bridgestone, Samsung, Headline, Germany’s Bacher and Ramplemann & Spliethoff, Belgium’s Stephex Stables, HORSE TIMES Magazine, Fibers Club, the Brooke Hospital, Shaker Group, Cairo Cotton Center, Marina Group, Symantec, Eastwind Academy, Equine Lab, and Bridgestone. Vendors included: Deyafa (Abo Elseeyd, Tabasco), Cairo Sitters and Ladylicious, with Amici and Cairo Jazz Club hosting international guests for two nights.